Repetitive movements in sports can lead to serious muscle imbalances in strength and/or flexibility. It is very common for athletes to experience shoulder pain or injury after years of repetitive overhead throwing, serving or swimming. While muscle imbalances can be avoided or improved with proper knowledge and training, they can also be enhanced with the wrong type of training. So what are these imbalances, and how do they affect overhead athletes? Shoulder pain is usually caused by a “pinching” of a rotator cuff muscle, or an enlarged and inflamed rotator cuff tendon. There are several reasons why these problems occur. The most common muscle imbalance for overhead athletes is a decrease in internal shoulder range of motion. Internal range of motion of the shoulder is very important for overhead athletes, as the shoulder can internally rotate as fast as 7000 degrees/second during a baseball pitch. If range of motion is reduced, performance will suffer and pain will be increased. The second most common imbalance is weakness of the muscles that attach to your scapula (shoulder blade). The scapulae work in close relation with the arm. Their main role during overhead movements is to raise the shoulder complex in order to avoid rotator cuff pinching. Both of these imbalances can be tested and improved by knowledgeable coaches. At SPARTA, athletes are evaluated and treated for movement deficiencies on a continuous basis. Repetitive movements cannot always be avoided, especially in more advanced athletes who have long training histories. So it is important for athletes to avoid “over-training” with repetitive movements. A baseball pitcher recently asked if swimming is an okay way for him to stay fit. Although swimming is a great cardiovascular workout, overhead athletes should think twice about swimming. A recent study in the British Journal of Sports Medicine reported that 71 out of 80 elite male swimmers suffered from shoulder pain. 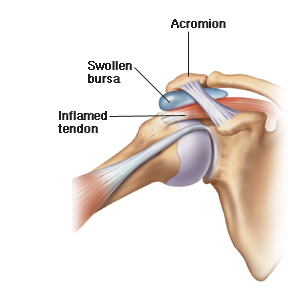 The pain was caused by rotator cuff “pinching” (84%) and tendonitis (69%). In the main swimming strokes (i.e. freestyle, butterfly, breaststroke and backstroke), the swimmer uses large arm forces to reach forward and drag the water. These repetitive movements are thought to be the cause of shoulder pain (i.e. swimmers shoulder). So the answer to the pitcher’s question? Excessive swimming should be avoided for overhead athletes. Occasional swimming probably won’t hurt too much, but repetitive swimming will decrease internal shoulder range of motion and increase the risk of tendonitis and pinching. Both of which are unfavorable for overhead athletes. Shoulder pain can last for a very long time if not properly diagnosed and treated. The best approach to preventing shoulder pain for overhead athletes (and to increase/maintain cardiovascular fitness) is to perform upper body exercises that increase shoulder range of motion and increase strength of the scapula muscles. The best choices include a variety of overhead pressing exercises, rowing exercises, pull-ups/chin-ups and Olympic lifts. However, proper technique is very important for each of these exercises and proper instruction/supervision is vital. Athletes need to be taught how to position and control their upper, mid and lower backs during each of these movements. With proper training and diagnosis, shoulder pain can be prevented, controlled or possibly eliminated. Dr. Phil Wagner is the founder of SPARTA, a San Francisco-based state-of-the-art science and performance based training facility and program just for athletes. Visit www.SpartaScience.blogspot.com and www.SpartaScience.com for more information.